We welcome you in our villa Sigalia extraordinary quality and design marionettes for unforgettable vacations and hospitality. 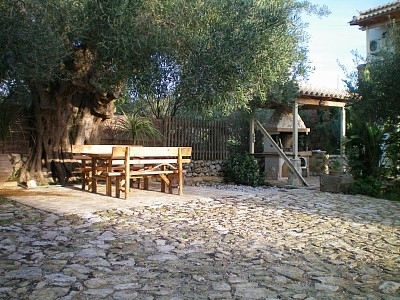 The island is fully green with fantastic routes in the olive trees and flowers on the hills and in the pine forests on the top of the mountains. Villa Sigalia sleeping 8 persons. There is satellite TV, DVD player, CD player and books collection. The bathroom has a bath and shower, hairdryer, wash-hand basin and toilet. 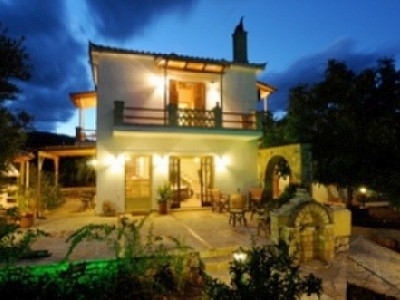 Villa Sigalia and attached cottage has four bedrooms. The master bedroom has a double bed, wardrobe . The other bedrooms have two single beds and a wardrobe. The cottage also has a double bed and bunk beds. Whether it’s Sailing, Windsurfing, Waterskiing, tennis, Hiking, Rock Climbing, or just chilling out, The Villa Sigalia is the perfect holiday for friends and families of differing ages, personalities and interests. Rates differ according to the season. Villa Sigalia has been decorated with elegance and style and provides all the modern amenities and conveniences, for a pleasant and comfortable stay! Rental includes, a generous welcome pack, with all you need to start your holiday. Every day pool maintenance, as well as clean sheets and house towels once a week. Normally 25% non refundable deposit is required to confirm booking and total amount due 6 weeks before arrival.